Puppy Parents Cards & Emails !!! 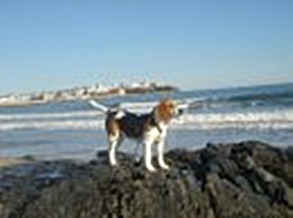 Beagles !-Welcome to the Home Page of my Canine Kids! Hope you are having a nice summer. I wanted to drop you a note not only to tell you that Max is doing well, but to let you know how people can't get over how cute he is. We get so many compliments not only on the fact that he is cute (after all, aren't all puppies?) but more specifically on his markings. We have been stopped in the street, people driving by us have stopped their cars, our vet etc., all commenting on what a good looking dog he is. 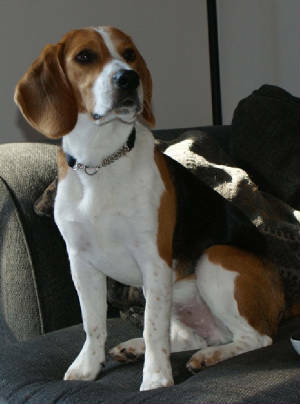 You breed great looking beagles and I wanted you to know! Max is doing well. He is a challenge but it is all good. He tries to eat everything, chew everything, he is now on to digging holes (I think we have moles) and is very vocal when he want another dogs attention. The kids love him, maybe a bit too much for Max. It was great though, Nick had banged his head really hard on a table (he was on the floor with Max) and started crying pretty hard. Max came right over to him, crawled into his lap, and started licking his face...priceless! And, I gave some women we met while walking, your website info. Hope all your pups are good! Hi Danielle - Thought you would enjoy seeing a recent pic of Jake. He continues to do very well! We switched him to a more roomy crate and are also giving him more freedom in selected rooms of the house. He's learning to "leave it" when he grabs things that he shouldn't. It's great that he's a good rider - he's done several trips to NH and one to Maine. He's about 20 lbs. but is keeping a pretty lean look. Is not a big barker, but gets excited and bays when he's going to get a treat. Loves to snuggle next to me when I sit on the couch - so much for keeping him off the furniture! He's a sweet little boy! 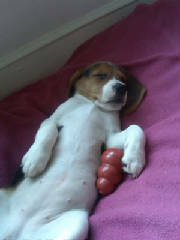 Steve wrote in on JULY 2nd, 2012 ALL YOU NEW PUPPY PARENTS THEY WILL EVENTUALLY "SLEEP IN " LOL !! Kathy asked me to send you some pix of Duffy. The first 3 were taken the day he came home. The next 3 were taken last week. He is growing like a weed! 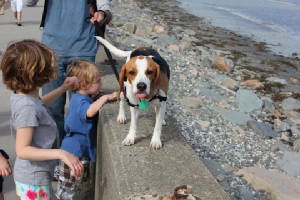 He adjusted to our home very easily and is the hit among our neighborhood and friends. He has made friends with our neighbor's dog which is a very gentle munsterlander (German hunting dog similar to a springer spaniel) and is the last pix. House breaking is having its good days and so-so days. Duffy really has a sweet personality. Now if I can just get him to sleep past 5:00 a.m., and no, Kathy is not the one getting up with him! Trish wrote in on March 17, 2021 and she was right I love it !!! Saw the St. Patty's day post and thought you would like this pic of Gully !
. Boomer is doing great. He is full of energy and mischief. He was terrified of the other dogs in his puppy kindergarten class at first. is as if he is our child! Hope things are going great at your end. I'm so gonna miss her playful shenanigans when I go to Illinois for a year. Take care Danielle, and I'll catch up with you soon. WOW almost 8 months old! 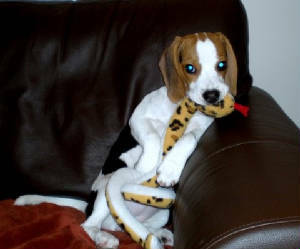 Winni is definitely a true Beagle. 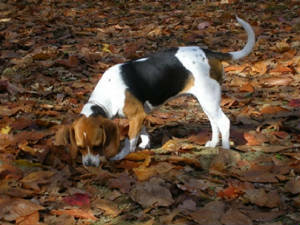 When outside, her nose is to the ground, her tail is pointed, and one of her front paws is upright. She is the love of my life. Her current official name is “Winni Wiggles Rocket”. She loves to dance and groove, hence the Wiggles and when Winni is outside she runs at the speed of light, hence the Rocket. 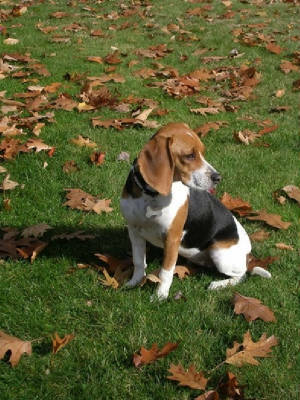 Winni is so fast that she almost caught a rabbit in the yard over the weekend. 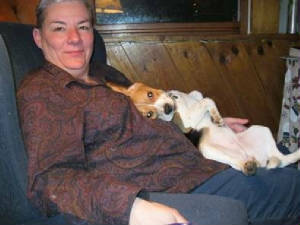 Winni is also very vocal – not barking or howling, but talking. It is a ton of fun to carry on a conversation with her. And yes, she still tries to run away with her water dish. I keep telling Winni that her dish isn’t a swimming pool. Winni actually has a ton of freckles on her face and paws but they don’t show up in this picture. I think she looks a lot like her mama Abby Ann. Hey we are going to be camping at Erving State Forest from July 10-13. 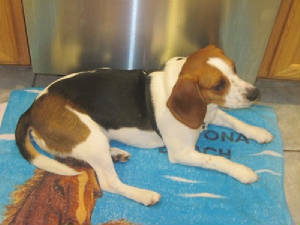 We would love to be able to stop by for a quick visit so that you could see Winni and she can see her Beagle family. Hopefully we can work out a date/time that is convenient for you. Oh and we can’t wait to take her camping!! 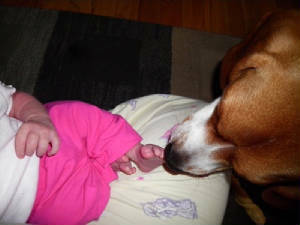 Ann writes in w/ her new baby news & buddy's new sister ! How are you? Hope things are great with you and all the kids at home! Sid and I were curious as to how you clean your dogs ears.. We use a ear cleaner and some cotton balls and stuff, and Zoey is a little squeamish. We thought maybe you'd have another way? I will write in more detail and attach pictures of Zoey soon. She really has a good time in the snow.. Mainly eating the snow!! hahah! Sorry I haven't written sooner about Maggie- Brian and I just got married and have been busy planning the wedding. When we went away for our honeymoon, she stayed with friends of ours who have three large dogs and did just great. But while we were away we kept talking about how we wished we could have brought her with us! It is great to be back. Maggie is doing just great! 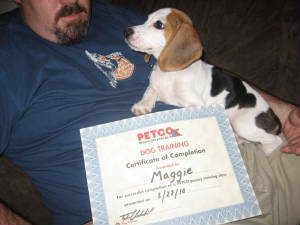 She completed the Petco training class and passed with (almost) flying colors (she has difficulty with the 'come' command). Having a dog has helped us meet almost everyone in the neighborhood. My sister joked that Maggie is like a celebrity, as neighbors call out to her when we take her for walks. She is very good with the kids in the neighborhood and is getting better playing with other dogs (she used to get too excited and not take hints when other dogs wanted to end play). It is hard to believe we have had her for almost four months- it's hard to imagine her not being here! The vet has recommended her being spade toward the end of next month- she is growing up fast. I've attached a few pics so you can see how she's grown. Hope all is well with you. Hopefully you will get these pictures of "LILY ANN" Had to come home early from vacation the vet said Lily Ann was not happy being boarded. SPOILED!!! We all missed her so very much! Hey Danielle, Oh Pebble is great...It's been a year this weekend with her, a wonderful year at that. Playful and quite energetic she gets me out walking everyday. Loves the park and especially enjoys the wooded trails in my area. The beach was a blast this summer, we took her on my boat several times. She would be up front, head up with the ears blowing in the wind...quite a scene. She did some swimming, though she's not exactly a waterdog. She has adjusted well to mine and Janets work schedule too, never an accident at home. A basket full of toys, bones and all the fixins, she's got that spoiled puppy thing going for her. One thing that stands out about her is the licking(kissing). Wow does she love to kiss peoples faces! She started out a finicky eater which was a surprise to me but has gotten much better. She's so much fun, and very well loved, thoughts of another....hmmm we'll see. I'll get you some new photos this week, nice hearing from you Danielle. Dozer is doing great. He loves being outside and playing soccer with the kids. He is getting big and is very healthy. He was a great addition to the family. He loves his playdates with our neighbors dog, they have so much fun together. The one thing that he still doesn't like is taking a bath . I attatched some pictures of him. Dozer going for a Ride ! Cocoa is doing great! She was spayed around the end of September and weighed over 16 lbs at that time – she’s growing like a weed! She’s a really good dog – Dan takes her to work w/ him 3 days a week and then she’s home with either my mom (who watches Natalie on Thursdays) or me on Fridays. We like weekends the best because as long as the weather is good we go for nice long walks up in the woods (of course hunting seasons are here, so we’re a little more careful). We really enjoy having her – even in the tough times when wrestling the socks, shoes and anything else away from her – but she has turned out to be a great addition to our family. I don’t have any recent pictures at the moment, but will take some and send them to you. You’ll be amazed at her size! 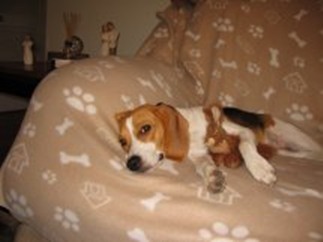 Everything went great at the vets – they thought Cocoa looked and acted great! Her temp was perfect (101)! They showed me how to clean her ears and clip her nails, of course she was a total wiggle worm. They think she’ll just be on the small side, but her heart & lungs were good. They said to go ahead w/ the science diet and try just mixing w/ water to get away from the wet food if I can. The picture attached is from last Sunday, so she’s actually even bigger now! Hope things are well with you and the litter you have going on now. Thanks for all your help and concern! Bella is doing great! She makes us laugh all the time, her personality is wonderful. Shes a ball of energy and also loves to snuggle. She is going to get spayed next month and is weighing in @ 20lbs. Training went really well, rarely will she have an accident in the house. We found a great dog park that we go to @ least 3 times a week (its a huge field and river that she plays in), I say park and she runs to the car and gets in her seat...haha. i was amazed how well she took to the other dogs, she is too funny watching her play. Everyone is amazed how fast she is, i think she can beat any dog there. I am also shocked she is not a howler, very rarely will she howl. I lucked out with that! She listens quite well too! 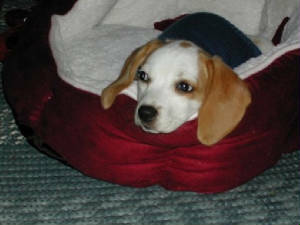 My previous beagle would get a scent and she was gone, not Bella! haha You breed some great dogs, I think i want another one soon! 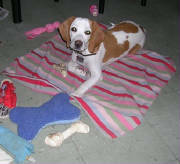 Thought you'd like to see Lucy playing with her toys! She's getting more vocal, she loves to sit and wait for her food, and then barks until it is ready, she is so so cute! On another note, I think you mentioned about having a FaceBook page for new owners of your litters, and would like to know more about that when you have a chance. Other than that, it would be nice if all the folks who have puppies from Cassy's litters could exchange their experiences with each other, so if you wouldn't mind, you can give out my name, and email, so we can communicate back and forth, if anyone is interested in doing that. It would also just be fun to get pics of the siblings as they grow. Lucy's played hard this morning, and is now sleeping, but shortly she'll be up and ready to go again, after eating! I need to send along a few new pics very soon, but won't do it in this email. Hope you have a wonderful Easter, and I'm sure hoping you are able to get some rest! energetic and sleeps a lot less now. Its a pleasure receiving all those sloppy kisses.. really cute! but she is such a smart cookie!! She gets spayed on the 10th Feb.
We'll keep you posted on how that goes.. I'm so sorry it took me so long to get back to you! 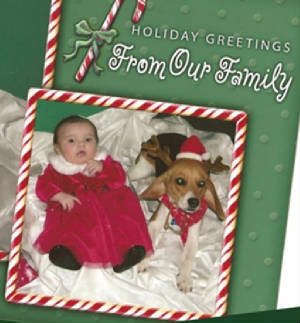 We just received your holiday card and it is adorable! Anyways, Mylee is doing great! She's a sweetheart! Her and Zoey get along so well, they are best friends! It's so funny, when Steven and I take them to the dog park, they still only play with each other! But every things going great! Also, Steven and I just got engaged! I hope you have a great Christmas and New Years! I can't believe Mylee's already turning one! Time flies! Well last night Lily Ann was loving her first snow storm! She was a real hoot to watch - she ran and ran in circles - catching snow balls - every time we brought her in - she barked to go back out!! Thank you for the great x-mas card. Talk to you soon. acting up it was weird, but hopefully he will be alittle more calm. laps or near the heater. Here are a few pictures. Pebble is great! a handful...but great. She's had two visits to the vet, everything is fine, nice and healthy. I've started to train her using simple sit, stay and come commands, as well as keeping up with the crate training. She is still teathing a lot, we keep plenty of chew toys around her. All in all, I'm very pleased with everything. I've yet to upload my photos onto my laptop, as soon as I do I'll send you some. Hope all is well, take care. He is great. He's a little over 11 pounds and having a blast with the girls. Thank you again. He knows how to keep us busy and i think he gets us more tired then we do him. Charlie is a character! He is allot of fun. Around 9 at night he is ready to go to bed. He will look at the bedroom door and look at me and I will ask him if he wants to go to bed-I open the door he goes up on my bed and goes to sleep. 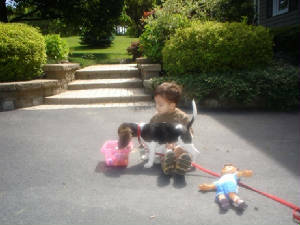 He gets along great with Bella she chases him around outside and they wrestle. If one of them goes out without the other they are happy to see each other when they get home. He is very good in the car-sits in the front seat like a good boy. He is very handsome-has a great shape-very muscular and he has that adorable face. I will send some new pictures soon. Charlie is doing well. He weighs 28 lbs and is very handsome. He did really well with training. He is alot of fun-has a great personallity. Just wanted to let you know Buddy is doing great. He's so smart and already sits on command. I can't believe he's 10 weeks today. These pictures are actually from last week. He's changed so much in the last 2 days! I swear he's growing by the hour. ~Ann Here's a quick note from Ann on Buddy's progress. 2009 Love updates ! Augie is doing great! We had our first vet visit with her last Thursday. She got her nails clipped & had a general lookover. We take her for her 2nd round of vaccinations on Saturday. She has started to really enjoy going on walks. At first, she was sort of nervous and unsure with the different noises & sights, but she has recently become more comfortable with her surroundings and enjoys running around & sniffing during her walks. 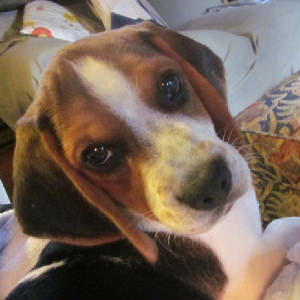 Augie's personality is really starting to show - she's so playful & energetic. :) She loves to run after her toys down our long hallway, bring them back, and run after them yet again. She's a trip! She's very loving, always giving Rashidi & I plenty of kisses. And, she's friendly. On her walks, people will come up and say hi and she seems to be doing very well with meeting new people. The whining has died down considerably. When she's in her crate and we walk away, she may cry a little bit, but she doesn't go on & on like before. I think she's showing great improvement, and she's probably starting to understand that we always return and are not going to leave her. All in all, she's doing very well & we are enjoying her very much. I'll keep you updated with her progress! 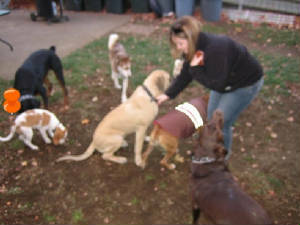 Catherine wrote in on the August's progress 2009,Thank You Catherine ,love to see my pups go to good homes !!! I just thought I would send you an update on Charlie. He is doing great with Bella. They get along very well as you can see in the picture. They play fight then snuggle up and sleep together. 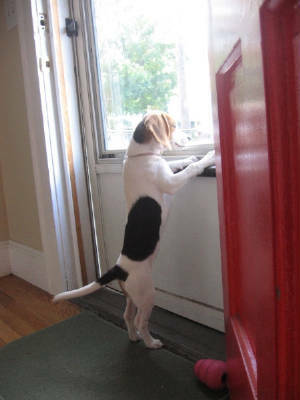 Charlie will definately be bigger than Bella-he is almost her size right now and she is about 18 lbs. He is more mellow than she is-likes to go in his crate and take a nap. He is very sweet but dosn't get pushed around easy by other dogs! I will keep you up to date. Chloe is doing great! She is already over 15 pounds. She loved the snow and now loves the rain. She comes in the car with me almost everyday to bring the girls to school and wines when they leave. Here's some updated pictures of her so you can see how big she has gotten. 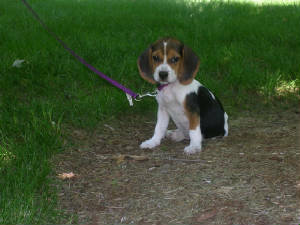 Pic of Chloe that is a tri-color Juno's Sister. Just thought you would like to see some pictures of Jackson. We are really enjoying him and love him very much. 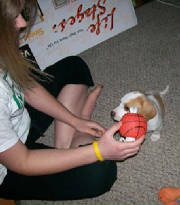 We took him to Kaity's basketball game on Saturday and he was the hit of the game. 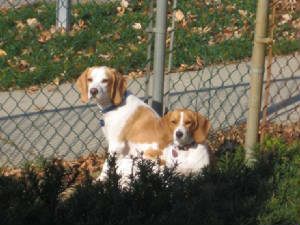 I had ladies sharing pictures of their beagles with me. His vet check went great. He is 9.3 pounds and healthy. THE PIC TO THE RIGHT IS OF "Jackson!" He's a lemon/white boy. "Zoey"... both gorgeous girls !!! had to post the pic ! 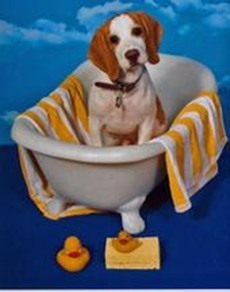 I hope all is well with you and your beagles! Im sorry that I missed your phone call last night, but i'd rather send you an email so I can send some pictures of Zoey and Mylee! Mylee is doing wonderful! She's still a little peanut, but is bigger and eats a TON haha, ( I think your right thats she's just going to be small) but, she's a little fire ball with a ton of energy, usually she's beating up Zoey, lol. 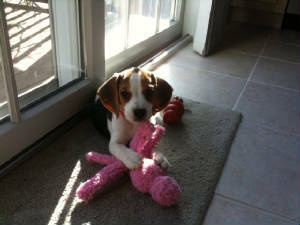 Mylee had her vet visit last weekend for a dewormer, and has another coming up the 28th of March. She's also doing very well with housebreaking! Anyways, she's been wonderful! The day Mylee came home I haven't seen Zoey's and My's tail stop wagging. Here's some photos of the two girls! Take care, and ill be sure to update you again soon! Especially after the 28th and let you know her weight! It's amazing how fast puppies grow! We're sorry we didn't get a chance to give you an update until now, but we were busy over the Christmas season. Thank you for the Christmas card. It was really cute. Daisy is doing great. 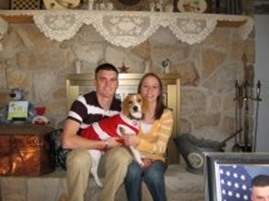 We currently live in Louisiana, where Josh was stationed with the Coast Guard. Now she's sniffing out and chasing armadillos instead of bunnies, but she enjoys every minute of it. We were home in Pennsylvania for two weeks at Christmas, and after being in Louisiana for a couple of months, Daisy wasn't sure how to react to the cold and icy grass when we first got home. Each blade of grass was like an individual icicle when we arrived, and it was funny to watch Daisy to try to walk on it because she had no idea what it was. She got tons of toys and treats for Christmas from the entire family and she got time to play with her doggy cousins while we were home. We think she would definitely like a playmate down here, but she enjoys being spoiled as the only dog too. 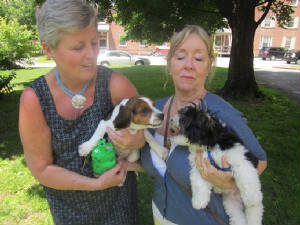 The new puppies are all very cute, and we hope everything is going well with them. We attached a few pictures of Daisy at the bottom. HOW CUTE ARE THESE CARDS !!! LOVE THEM !!!! Baby Gianna & "Lu Lu"
Here is another Holiday picture from Debbie of "Lu Lu" with new grandaughter "Gianna". 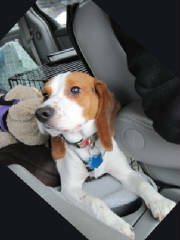 Here are some Holiday pics from Joanne of "Baxter" . Sarah's SPOILED baby :--) "Oliver"
THANKYOU SARAH ! I LOVE SEE MY BABIES SPOILED AND MY GOD IS YOUR P ICS CUTE ! THE PUMPKIN OUTFIT!!!! LOL !!! 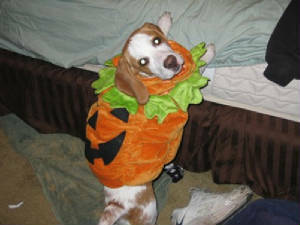 "Oliver at Holloween" TO CUTE !!!!!!!!!!! !